Young Athletes Risk Back Injury By Playing Too Much : Shots - Health News Sports medicine doctors say they've seen a rise in overuse injuries among kids who train long and hard. Jack Everett sat on his living room couch wearing a back brace, eyes glued to a massive TV set playing his favorite video game, NHL 2013. "I'm the Boston Bruins," the 10-year-old said as he deftly worked the video controls. "The guy that just shot was Milan Lucic. He's a really good guy on our team." Whether at home or during recess at his elementary school in suburban Los Angeles, Jack's young life now is about sitting still. "Well, I can eat lunch with friends, and I play cards," Jack says. But his classmates are out running and jumping outside. That's a big change from last year, when Jack played club soccer, with multiple practices and games in a week. At age 10, Jack Everett has to wear a brace because of a fracture in his back. "He was doing a morning endurance workout and afternoon skill session," says his mother, Marcia Riso. "About two hours for each. The coach would often have extra training on the weekend and/or scrimmage. Games were played on the weekends, including tournaments, which were two days long." Then his back started hurting during games. His parents thought probably it was a pulled muscle. A sports chiropractor gave Jack massages and muscle stimulation. But it didn't help. Finally, at a tournament in Orange County, the pain became unbearable. "I played, like, one or two times," says Jack. "And then I just couldn't do it anymore." Jack Everett had broken a bone in his back. The official diagnosis was a pars stress fracture in his lower back. Jack's doctor said the injury was due to overuse. "Who knew," says his mother, "that elastic little kids can break?" Sports medicine doctors say they've seen a rise in overuse injuries among young athletes like Jack. The toll on knees and ankles is well-known. But many parents are surprised to learn that children can injure their backs, too. Jack was all in with his beloved soccer. He joined a club team that practiced and played 11 months out of the year. Riso says she and Jack's father wanted their son to play several other sports, too, so he wouldn't burn out. But Jack was as adamant as a 10-year-old can be. It was all soccer, soccer, soccer. "So we thought," says Riso, "this is what he wants to do and he's great at it. Why not?" But low back injuries like Jack's can keep young athletes laid up for months, according to Dr. Neeru Jayanthi, an associate professor of orthopedic surgery at Loyola Medicine in Maywood, Ill.
Jayanthi studied more than 1,200 young athletes, and found that lower back injuries were the third most common injury in athletes younger than 18, after knees and ankles. He presented the data last year at the American Academy of Pediatrics conference. Almost half of the back injuries were severe enough to sideline kids for one to six months and put them at future risk for long-term back problems. These back injuries are most often caused by repetitive bending, Jayanthi says, combined with high levels of sports participation. Young athletes can reduce the risk of back injuries by not spending more hours a week than their age playing sports, Jayanthi says. Also, they should not spend more than twice as much time playing organized sports as they spend in gym class and unorganized play. Jayanthi also recommends something that many young athletes and parents would find inconceivable: Don't specialize in one sport before late adolescence. That's easier said than done in the midst of a youth sports juggernaut that puts a premium on hypercompetitive training and playing at the earliest ages. Jayanthi understands the dilemma. And like any man of science, he seeks data to prove a point. A comprehensive review he published in the Journal of Sports Health examined the impact of early specialized training. "And if you look at all sports," he says, "there are only two types of sports where specializing early leads to greater success later." He says those sports are gymnastics and diving, because young athletes in those sports have to compete before becoming fully mature. Publishing a paper is one thing; it's another to convince what Jayanthi calls "the stakeholders" in a culture dedicated to intense youth sports. Coaches, sports organizations, sports manufacturers and, yes, parents. Like Marcia Riso. "We thought, wow," Riso says. "Jack's getting excellent training. He's got an excellent coach. He's working so hard. He could really do well in this sport. And he's starting so young — we thought that was a positive. Because it is so competitive. ... And it's so much about winning. Which isn't a bad thing. I believe in healthy competition. 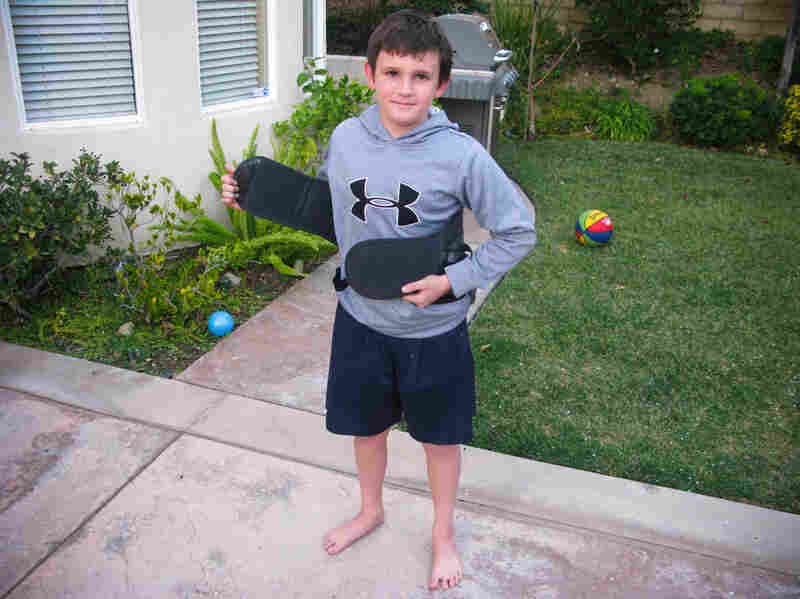 But ... "
When Jack Everett finally takes off for good the back brace he wears most of the day, he'll have a different sports experience, says his mom. The plan is to diversify — doctor's orders, in fact. Riso says it makes her kind of sad because Jack loved his soccer team so much. But not as sad as it makes her watching her son cope with injury and inactivity. And there's a silver lining. Once Jack is able, physical therapy to strengthen his core and his glutes should make him one strong little kid. Riso told him at the end of it, "he'll have 12-pack abs. "And he's very excited," she says.